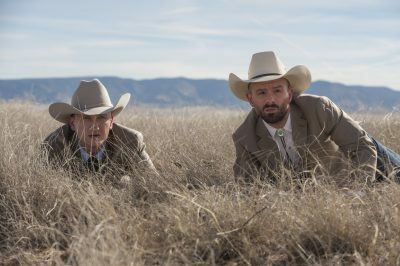 Last night’s episode of Preacher, ‘See’, has left us with more questions than answers. Do you have a list going? I know I do. More on that at the bottom! The foundation is still being laid for this show, so it’s no surprise that we find ourselves with more questions than before we started ‘See’. Sadly, since there’s so much happening we’ll have to wait until another time to discuss Jesse and his rolled up shirtsleeves. A little girl lays sick in bed, clutching a doll. He mother sings to her while a man cloaked in shadows stands in the doorway. She tells him that he has to go and hands him a piece of paper with a type of medicine written on it. The man takes off on a horse across the desert and eventually runs into a caravan of people St. Louis. The man, who seems likes a preacher, goes on and on about time and how the world seems better out there even though they’ve seen some bad things. “Do you agree that this is paradise?” the man asks. “It ain’t.” our shadowed man says. The next scene finds the man having left the caravan and riding his horse by a tree full of Native Americans who have been scalped and hung. 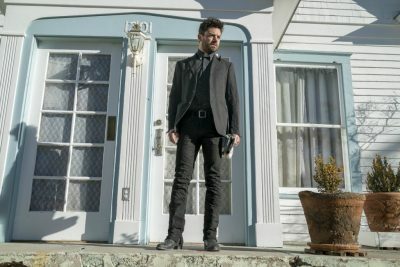 On last week’s Talking Preacher, the author of the comics told us that Preacher was very much a western at heart. This episode led with that feel. We open here with Jesse baptizing all the people of his congregation. The two men who blend in so well are watching from a distance. When it seems to be over, Tulip shows up. Emily comes up and asks him about Tulip but he deflects. Then we go inside to where she’s trying to work the espresso machine. Cassidy walks up and acknowledges that Emily seems to be in charge of the administration stuff, and he needs an advance. Emily doesn’t seem to think Cassidy deserves any money at all since the air conditioner is still broken. Emily goes to Jesse with her concerns about Cassidy, specifically the fact that he drank half a case of communion wine. While this is going on, Cassidy has a run in with Eugene and makes a bit of a scene. After the sheriff calls his son away, Jesse explains to Cassidy that Eugene tried to kill himself and that’s why he looks the way he does now. Jesse tells Cassidy that he’s happy that he’s there, but he can’t cause anymore trouble. Outside, as Eugene and Sheriff Root leave, a man yells ‘murderer’ at Eugene. When the sheriff turns around and confronts them, none of the men say anything else, but it makes you wonder a lot more about what happened with Eugene. Inside the church, a man confesses to Jesse that he’s having sexual thoughts about a child on his school bus. He seems like he’s glad to know Jesse can’t tell since he’s a preacher and it’s confidential. Jesse is losing his patience and you can tell he’s about to snap as the man goes on and on about the girl he’s having inappropriate thoughts about. Jesse has him reiterate that he won’t be forgiven by God for anything as long as he continues to behave the way he is, but just looking at the man, you know he’s not changing. Later that night, Jesse is sitting out on the front steps of the church and the dogs continue to bark all around him. He yells, “Quiet!” and everything goes silent before he walks back inside. Odin Quincannon sits in front of two people and buys out their farm. His assistant, Donnie, has some trouble getting the legal documents out of his briefcase because of his broke arm courtesy of Jesse and ends up dropping a pen. After the people sign, they move things out of the house and then tear it down. 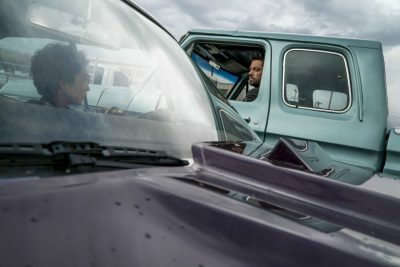 Once they’re in the vehicles again, Donnie breaks the driver’s nose against the steering wheel because he didn’t help him with the papers before. Turns out Donnie’s pretty horrible to everyone. Emily and Jesse are out in front of the grocery store, taking suggestions on what could make the church better when he sees the school bus pass by. He knows that whatever he said before hasn’t worked and the little girl is still at risk. He gets in his truck, but finds that his steering wheel has been taken. Tulip pulls up beside him, sassy as usual. At the church someone has messed with the sign again and Cassidy is waiting outside for Jesse. They go in the church and wind up drinking in the pews. Cassidy doesn’t believe that God has planned anything for Jesse, and that he needs to get out of the town they’re in. It’s boring plan that God has set him on, and he’s made for more than boring. They get into it after that, and things end with Cassidy admitting his a vampire and being hunted down, but Jesse doesn’t believe him. He steals Cassidy’s flask, but Cassidy warns him not to drink it because it’s basically a mix of poison. Jesse still takes a drink and ends up passing out immediately. Cassidy takes his keys and leaves Jesse passed out on the church floor. At a hotel in town, a cleaning lady tries to offer the two incognito guys towels but he shows her his gun and she leaves quickly. They haul a huge chest from the hotel and head to the church where they open it up and place what looks like a tin can on Jesse’s (who’s still passed out) midsection. It turns out the chest is a big music box, and one of the guys starts singing a nursery rhyme. Once he gets to the end and nothing happens, they decide the best course of action is to cut Jesse in half with a chainsaw. Luckily, Cassidy shows up at just the right moment to stop them. He spends too much time talking, though, and gets shot, but that doesn’t stop him. What follows next is an awesome fight scene between Cassidy and the two nameless men. As the fight ends and Cassidy ends up winning, the chainsaw has gotten away from them and is skittering toward Jesse on the floor. Cassidy stops it just in time from it cutting him open anyway. Tulip is playing poker with a group of men and is racking up. She’s about to start a new game when her phone rings and someone named Dany. She tells him that she’s got hers, too. Either this means her part of the map or her partner in the endeavor. She decides to stay the night at the whorehouse, but we know that she’s going to be looking for Jesse soon about the job. After Cassidy heals enough, he starts cleaning up his messy kills in the church. Throughout all this, Jesse lays asleep on the floor. Before he can get the men buried out back, the sun has risen and Cassidy is stuck inside again. The next morning Emily arrives and wakes up Jesse. He’s on his way to visit a family whose daughter is very ill. The teenage girl is unconscious and her mother is rubbing lotion on her face. The girl’s mother isn’t in a good mood, but why would she be? 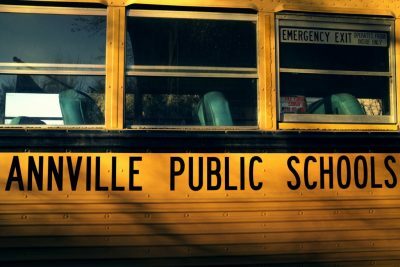 Jesse leaves her house and sees the school bus passing by again, and you just KNOW something is going to be done about that. One his way back to the church, he stops because there’s a car seat in the middle of the road. Before he can do anything, someone comes up behind him and tasers him. He’s knocked out and wakes up in a room, chained to a bed by his ankle. Of course it’s Tulip. She tries to get him to change his mind about helping her, but he still refuses her. Tulip tells him that Dany’s friend wants to buy the map, and in exchange, he’ll give her some very interesting information. Jesse doesn’t take the bait and when he doesn’t ask what that is, she gets really testy. She straddles his lap and gets right by his ear and tells him that he hasn’t changed. He’s still the same man he was before, and that man will eventually find his way out from behind that collar his wears. Tulip starts to leave the room and Jesse asks for the key to get out of the chain, but she kicks the chain towards him and tells him there was nothing keeping him there before leaving him. Eugene shows up and tells Jesse that even after his baptism, he doesn’t feel like anything has changed. He doesn’t feel different or that God is listening. He just wanted it so much that he made himself believe it. He asks Jesse to baptism him again, but Jesse refuses and tells him to keep trying. That’s the moment Jesse realizes that the man that drives the school bus won’t change without some intervention. The scene cuts to Jesse going to this man’s house and breaking in. He peeks through a few rooms before finding him in the bathroom. The man asks what he’s doing there, and Jesse punches him then tells him that he’s going to forget the girl. When the man plays dumb and asks who, Jesse starts filling the bathtub and takes off his jacket and rolls up his sleeves. The man tells him that he can’t just come into his house then begins to tell Jesse that he has an addiction and urges. He can’t turn them off. Jesse clearly has had enough because he starts dunking the man into the water again, similar to his baptism earlier, and yelling that he’s going to forget the girl. Finally, his voice takes on that powerful note and they both fly back. Jesse has no idea what happened and neither does the other man. The man is freaked out because he doesn’t know what’s wrong with his head and Jesse runs away because he has no idea how he caused the man to forget everything with just a command. Cassidy buries the chest with the men’s bodies in it, and thinks he’s finished up the job. Sheriff Root sits in front of the two nameless men that Cassidy killed and thought he buried and asks them who they are. He doesn’t like strangers in his town and wants to know here they’re from. They tell him they’re from the government. Jesse asks if he can go in and pray with the girl who’s in a coma, and once he’s inside, he uses his voice that seems to be working more and more at his command, and tells her to open her eyes. 1. Who are the guys that can’t be killed? 2. What was the importance of that flashback to 1881? You know that meant something. 3. What’s in this map of Tulip’s? 4. Why did they call Eugene a murderer, and what does that have to do with his suicide attempt? 5. The most important one of all, what will Jesse do now that he can tell people what to do? What are some of your questions moving forward through season one?